We stopped here in 1986, coming home from a year in British Columbia with our infant daughter, and this was then, as now, our westernmost woods of familiar cold-sensitive broadleaf trees. We noted the striking uniformity of the bark of the trees, and the diversity of their leaves. Here on the boundary of the -40° C trees the bark must be very important to winter survival, and many trees seem to have been split, in long spiral wounds, healed over with labia of new bark. All the trunks have cracked dark grey-brown corky rinds, running upwards in narrow diamond-angled reticulations - the Bur Oak flaking off pieces of bark more often than the other, the White Elm more evenly split, but all so alike that you have to look at the leaves to tell the species. These range from saw-toothed, abrasive-rough Elm, to irregularly notched baby-soft Manitoba Maple, and the tear-drop regularity of Ash, to the dark-green, silvery-beneath Bur Oak with lump-lobed leaves of many shapes. Now, nearly 30 years later, the woods and fields are very much the same, except that the riverside forest looks more ravaged and tangled from the recent record high floodwaters, and the fields and forest floor are paved with new mud. There's a freshly road-killed Raccoon on the midline of the highway a bit ahead of me, and this is what's holding the attention of two Eagles, and at least ten Ravens. As I paint, I notice a Raven, flying and calling, apparently making repeated attempts to persuade Fred to follow upstream, with four-grawk instructions. Fred says that while you may not understand what a Raven is saying, you've got to pay attention because they say it in such a scholarly way. Now, Fred not having understood, this one flies off saying "yikes!" with a presumed mate, as Fred doggedly insists on patrolling the banks, finding tracks of Beaver, Deer, and Muskrat in the clay among drifted Ash seeds, and deposits of land snail shells to be sorted later. Everything here is coated 1-30 cm deep with clay from the summer flooding, most impressive when it covers tilled fields, now cracking into polygons, and with a sparse vegetation of what's germinated on the top or pushed through. Polygonum amphibium (Water Smartweed), which we'd noticed along the river in 1986, is the big winner, with robust patches sprawling over the mud several metres above current water level - but all the mud weeds we'd seen along the Athabasca River are also present, including the little Liverworts in the shadier areas. Fred continues down a gravelly creek out toward the river, and back through Manitoba Maple woods and Sandbar Willow thickets where the mud deposit had cracked into curved shapes rather than polygons. A couple of kilometres upstream of my painting site is the Highway 83 bridge over the River, and there Fred passes an area of sparse native Big Bluestem (one of the few grasses we recognize) and down onto a bar below the bridge, which is coated with 3-40 cm of mud cracked into polygons. Most of the area of the bar bristles with bent over and river battered Sandbar Willow with only a few shoots in leaf. There are no Beaver tracks on the bar – they must have had to find an alternative food source – but tracks of Raccoon, Otter, Muskrat, and Mink show that it has been thoroughly patrolled for edibles. 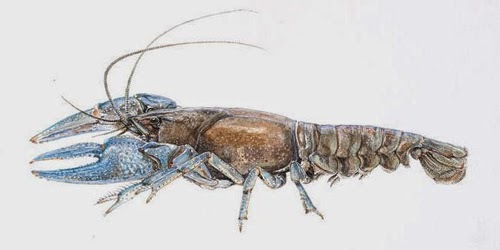 It's easiest to find riverbed creatures at times of drought, so with the high water levels we've seen all across the country, we've needed a few instances of pretty good luck to find the Unionid mussels and Crayfish that so much of our exploration focuses on. Here the good fortune is that the flood – equal to, or greater than, a 2011 flood that had been called a '300 year event' – has washed a generous sample of the Unionid mussels of the river up onto the bar, 2.5-4m above the current water level. Fred is led to the first cluster of surviving mussels by Otter tracks and big opened pairs of valves, mostly from cracks in two low places that must have held water until fairly recently. 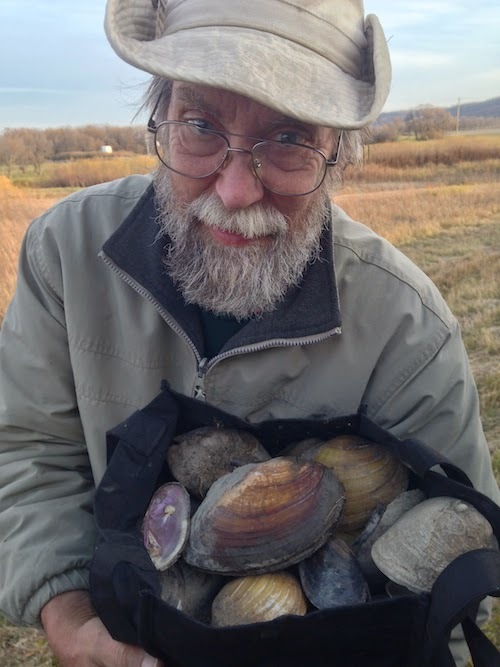 He dug up at least 50 of these desperate clams from among the shells of their neighbours, and tossed them to safety over the 2.5 m drop into the deep water flowing past the bar. There's a great variety of species, dead and alive - one of the Lasmigona complanata (White Heel-Splitter) may be the largest Unionid we've ever seen. Fred picked up Amblema plicata (Three-Ridge) that we've previously known only from around Lake Erie; Ligumia recta (Black Sand-Shell) that we'd previously added to the known fauna of thePetawawa River - here at the western extremity of its range; a few Pyganodon grandis (Common Floater); one Fusiconia flava (Pig-toe) valve with adhered flesh, and a whole range of sizes and shapes of Lampsilis (Lamp-mussel) which will later be sorted into Pocketbooks or Muckets (L. ovata or L. siliquoidea). Fred has now returned with his heavy bags of huge and amazing shells, so I must pack up my paints and stow my partially finished painting safely on the dashboard, its edge snug against the windshield where it won't be smudged. A car stops at the road-killed Raccoon, which other vehicles had been swerving around. The driver emerges and tosses the carcass onto the shoulder of the road. We've often been asked what removes carcasses from roadways, and here's an example of direct human action. The return of the bald eagle is environmental good news. Preservation of the vulnerable water is an even bigger hurdle. You and Fred are brave souls to try to educate people as to the dangers that are coming if we continue along with path of consumption. Thanks for caring and for trying Aleta. We saw as many Bald Eagles in 2014 as we'd seen in the previous decade. But this recovery has taken 40 years since the banning of DDT - once a mistake has been made, recovery often takes a long while.